This is the January block from this year's Kansas City Star. I did decide to make this quilt my first foray into Cotton Theory, based upon Betty Cotton's book. and the Cotton Theory scissors I was fortunate enough to receive as a door prize at my guild's January meeting invaluable. 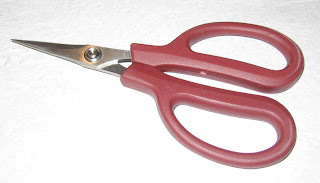 The Thang holds material in place quite well when I'm sewing on the machine, and the scissors are incredibly sharp and precise. 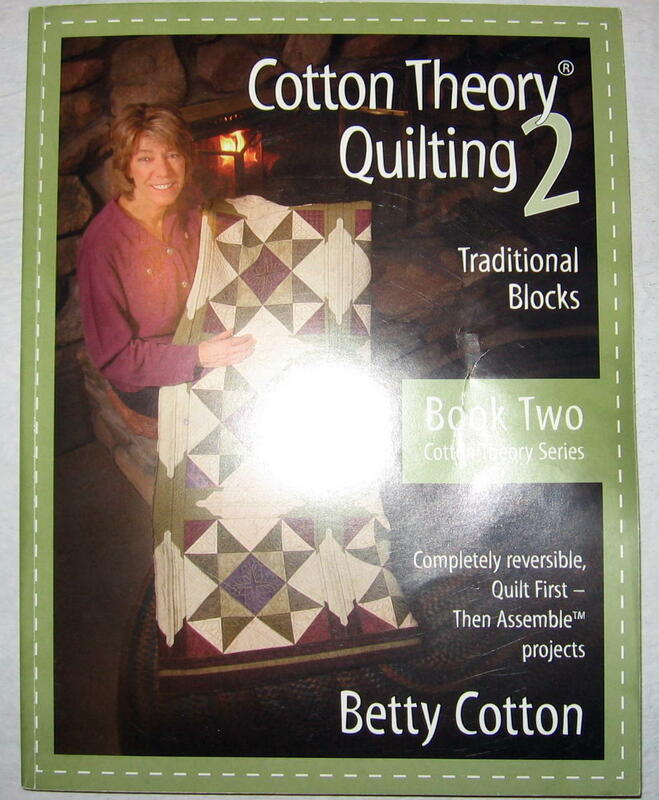 Cotton Theory quilting seemed to suit my purposes well since it is a quilt-as-you-go technique and I would almost be finished (assuming I keep up) come December. 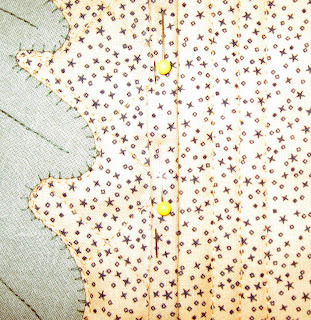 I used Betty Cotton's One-Way Street technique for the seams between blocks. 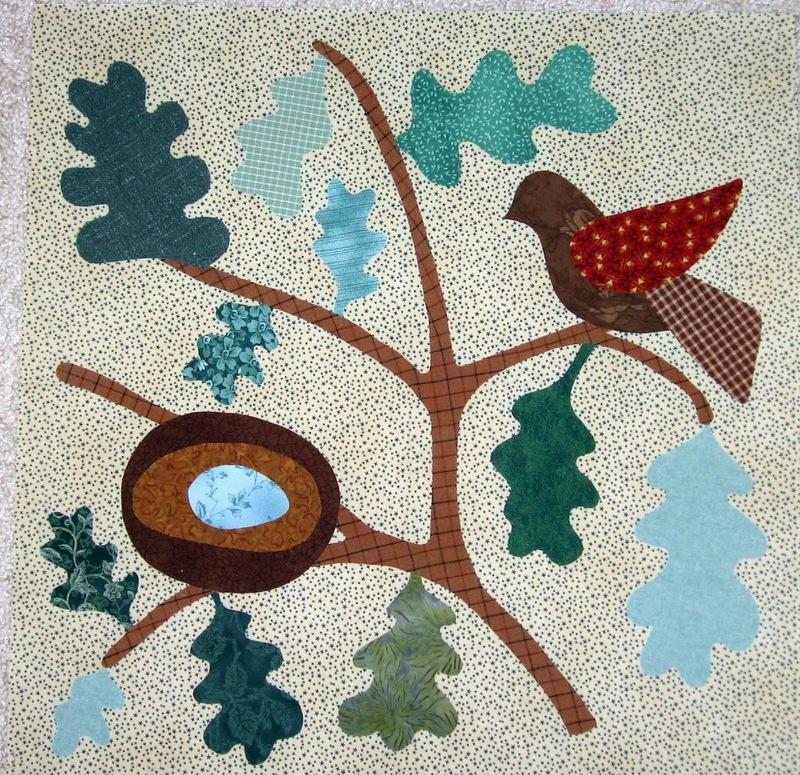 Because this was my first attempt, I made the eventually proven-to-be wise decision to make the sashing on the front of the quilt from the same background fabric I am using for the blocks. 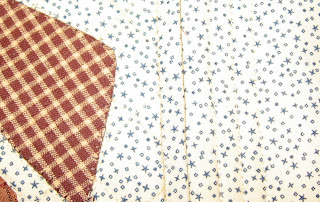 I figured the common fabric would hide some of the technical mistakes I would make because of my inexperience. I didn't want the back to be totally bland, so I am using a dark blue print fabric for the backs of the blocks and a red print fabric for the back of the sashing. 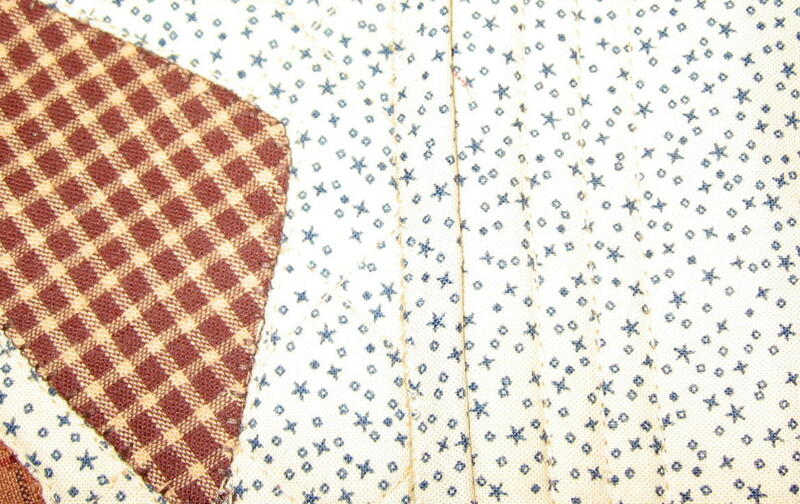 Cotton Theory involves one-inch seams between quilt parts, but the One-Way Street technique works if the block in front has only a 1/4"-seam allowance. It's intentionally difficult to see the stitching on the front, so you can see how I quilted the sashing with three straight lines more clearly if you look at the back. Quilting is so much easier with small pieces instead of a whole quilt! 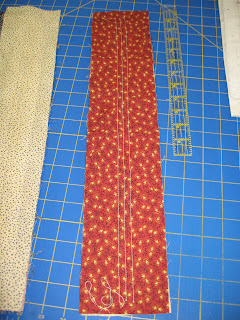 This is my One-Way Street seam connecting the block and the sashing all pinned and ready for the machine. 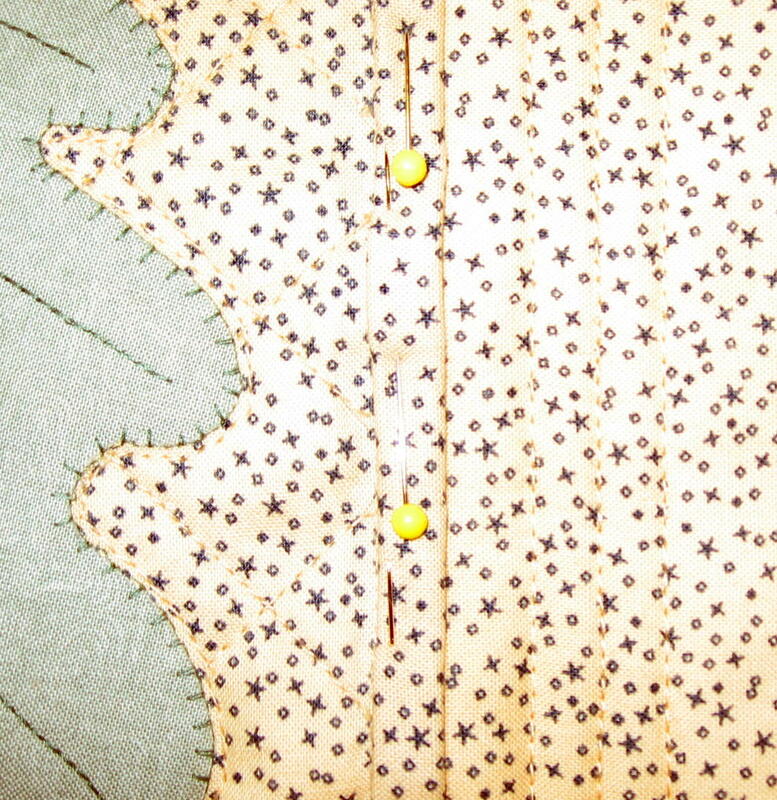 The folded edge of the One-Way Street (just to the right of the pins in the photo above) is not sewn down, so the front of the quilt will have more texture than my quilts usually do (and I won't have to pay a long-arm quilter either). 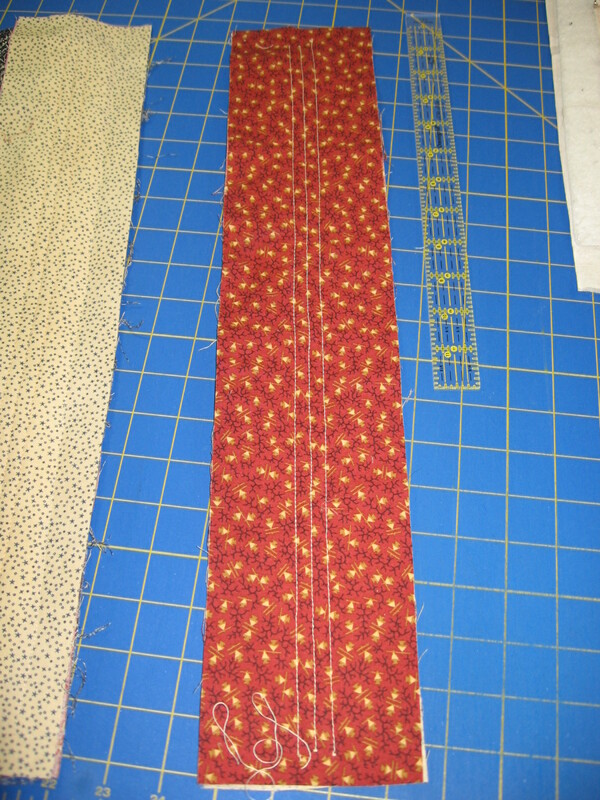 This is what the seam on the front looks like now that I zigzag stitched it down. I'm hoping my technique will improve with practice. The February block is a Mariner's Compass block. I made my first attempt last night, which, to put it charitably, was a learning experience. This afternoon I bought some template plastic and will try again.